Nnamdi Kanu’s visit to Imo State yesterday was a blessing to some people, while to some Imolites it caused them unexpected difficulties. 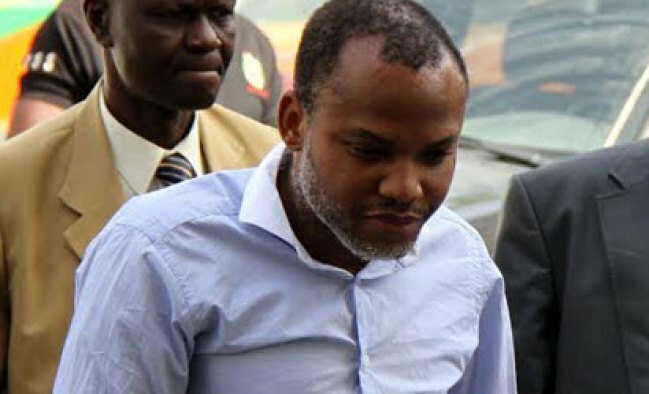 Some Imolites who were interviewed by a Vanguard correspondent, said they had to take the decision of spending the rest of the day celebrating the visit of Nnamdi Kanu, while some motorists said that it was not a savoury experience for them as they were trapped in a hold up for more than eight hours. Also the street hawkers said that they had never experience the kind of patronage they had during the visit of IPOB leader. Even those selling Biafra insignias, asked Kanu to come for second missionary journey and that his coming brought blessings and food on their table. Also 28-year-old Chima Mbata from Nkwerre Local Government Area, Imo state, said he got healed of his two days headache after sighting Kanu from the crowd. Iheme said: “I was in the House and my mother called me to come out and see Nnamdi Kanu, at Orlu road roundabout, I told her that I can’t come because I was not feeling fine. 0 Response to "28-year-old Gets Healed After Sighting Nnamdi Kanu In Imo State"